A self-propelled dry-cutting gas saw ideal for medium to heavy-duty commercial, industrial and paving applications. The Husqvarna 2000 is designed for versatility, ease of use and high production capabilities. Three blade widths can be used, allowing for different joint widths and crack control simultaneously. Features include a 9 hp engine with automatic compression release for easy starting, chain driven overhead cam system, superior cooling, excellent lubrication system, and a cyclone air cleaner to increase engine longevity. 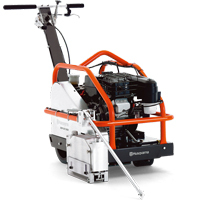 Soff-Cut® technology – Husqvarna Soff-Cut is a unique patented system for early entry concrete sawing. This technology enables concrete to be cut within the first one or two hours of finishing and before final set. 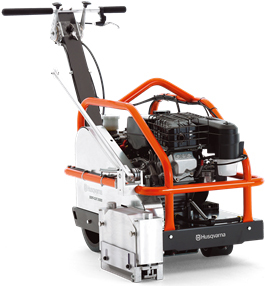 Husqvarna Soff-Cut™ provides the best solution for minimizing the risk of random cracking, and it simplifies the working process, compared to conventional sawing.